This issue’s cover illustration by James Mayhew is from Katie and the British Artists. James Mayhew discusses his work here. Thanks to Orchard Books for their help with this July cover. 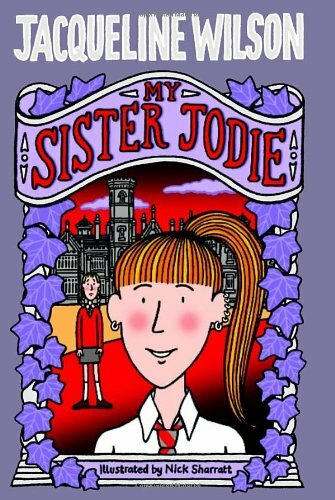 Take two sisters: rebellious teenage Jodie and devoted book-loving Pearl. Add parents anxious for a better life, a boarding school in a crumbling turreted mansion, ex-teacher Mrs Wilberforce, bitter after being left paralysed by a fall, and a collection of pupils left to spend the summer at school – protagonists removed from their comfort zone with a chance to explore a new environment and new relationships. Wilson seems to have several agendas at work here. She is renowned for representing life in the raw, and many of her huge and loyal readership value this ‘real life’ aspect of her work; she has also spoken out recently about the premature sophistication of children and acknowledged that her work may well be a contributory factor in this. The simpler pleasures of childhood and countryside can still be satisfying, however unrealistic. As Children’s Laureate, Wilson promoted the role of libraries in offering a route to new experiences and ideas. Pearl borrows the classic girls’ stories about miraculous recoveries (What Katie Did, Heidi) from Mrs Wilberforce and escapes into magical fantasy lands, at the same time understanding that fairytale endings don’t always happen in real life. So the final tragedy of the book, involving Jodie’s fall from a window, doesn’t altogether surprise. What does, though, is the way that Pearl’s parents announce, on the day of Jodie’s funeral, that they are expecting another baby. And that the whole story has, in fact been told retrospectively by Pearl in an attempt to describe how good Jodie had been as a sister to her, and how she hopes to emulate that for her new baby sister. There is no hint of this as we read the story – and none of the subtlety in adjusting to sadness and loss with all the many emotions involved, that Wilson gives in Vicky Angel. I found this shocking, as did some of the older girls I discussed it with; however the 10-year-olds I consulted didn’t seem to notice. Those who like Wilson’s books loved this one, perhaps relishing the tragedy; those who don’t (yes, they do exist!) enjoyed it too.